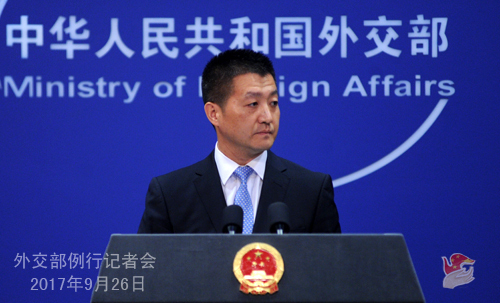 At the invitation of Foreign Minister Wang Yi, Minister of Foreign Affairs and Expatriates Ayman Safadi of the Hashemite Kingdom of Jordan will pay an official visit to China from September 26 to 28. Q: According to reports, the ROK President Moon Jae-in yesterday said that during his presence at the General Debate of the UN General Assembly, the most important outcome is to reaffirm the principle that the international community should peacefully resolve the Korean Peninsula nuclear issue while imposing high pressure and sanctions on the DPRK. The ROK Foreign Minister Kang Kyung-wha also said that imposing pressure and sanctions on the DPRK serves as the diplomatic means to bring the DPRK back to the serious negotiating table for denuclearization instead of aiming to disintegrate or bring down the DPRK. What is China's comment on this? A: We have taken note of the relevant report. The statements made by the ROK top officials accord with China's consistent position that the Korean Peninsula nuclear issue should be peacefully resolved through political and diplomatic means and the DPRK-related resolutions of the UN Security Council should be implemented in a comprehensive and complete manner. We have kept stressing that all the DPRK-related resolutions adopted by the UN Security Council contain two aspects. On the one hand, these resolutions reflect the position of the international community to oppose the development of nuclear weapons on the part of the DPRK. On the other hand, they also reaffirm the commitment to peacefully resolving the Korean Peninsula nuclear issue through political and diplomatic means and support the resumption of the Six-Party Talks and the commitments made in the September 19 Joint Statement. These two aspects are equally important and they can neither be overemphasized nor overlooked. 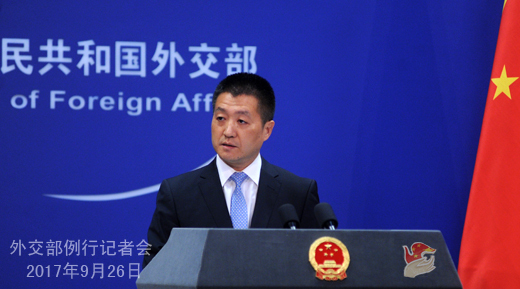 The sanctions only serve as the means and the goal is to urge the DPRK to take seriously the common concerns of the international community and come back to the right track of settling the issue through dialogue and consultation at an early date. We agree with what the ROK Foreign Minister Kang Kyung-wha said that the aim of imposing sanctions and pressure is not to bring down the DPRK. With regard to this issue, we also agree with the Four Nos promise which has been reiterated by US Secretary of State Rex Tillerson once and again. We hope that the US and the ROK can earnestly translate these commitments into concrete actions. We also hope that the DPRK can work for the shared goal. Q: Does China still have diplomatic channels to communicate with the DPRK to express its concerns about the situation on the Korean Peninsula? The DPRK Foreign Minister said that President Trump's comments amounted to a declaration of war and that the DPRK is ready to shoot down US bombers. Is the Chinese side concerned about this? A: We maintain normal diplomatic communication and contacts with all relevant parties, including the DPRK. You mentioned the remarks of the DPRK Foreign Minister at the UN General Assembly yesterday and the seemingly escalation of the war of rhetoric between the US and the DPRK which has once again aroused the concerns from the international community. Regarding this issue, we have noted the relevant report. I believe the friends from the press have also noted that the US has explicitly denied that it has declared war on the DPRK. The US also said that it will seek peaceful means to realize the denuclearization of the Korean Peninsula. I do not know whether you have also noted that H.R. McMaster, the US President's National Security Adviser, also said yesterday that there is no easy military solution to the Korean Peninsula issue and there is not a military blockade that can solve the issue. He added that ultimately it would come down to an international effort. Recently, we have heard so much vociferous call for taking military measures to resolve the Korean peninsula issue. We hope that the statesmen from both the US and the DPRK can have sufficient political judgment to realize that resorting to military force will never be a viable option to resolve the Korean Peninsula issue and address their own concerns. We hope that the statesmen from both the US and the DPRK can also come to recognize that being bent on assertiveness and provocating each other will only increase the risk of confrontation and conflict and reduce the room for their own policy maneuvers. War on the Korean Peninsula will produce no winners and it will even bring misfortune to regional countries. Bearing in mind our consistent position that the Chinese side opposes war and chaos on the Korean Peninsula, we strongly disapprove of escalating the war of rhetoric between the US and the DPRK. Q: While visiting China yesterday, US Secretary of Commerce Wilbur Ross called for the fair and reciprocal treatment of US enterprises in China. Do you have any comment on that? A: During the visit of US Secretary of Commerce Wilbur Ross to China, Premier Li Keqiang and Vice Premier Wang Yang met with him respectively. Minister of Commerce Zhongshan also held good talks with him. The visit of US Commerce Secretary Wilbur Ross aims to follow through on the consensus reached by the heads of the two states, further promote the economic cooperation and trade between the US and China and lay the groundwork for President Trump's state visit to China this year. We have released the relevant information on the meetings and talks of Commerce Secretary Wilbur Ross. You can refer to it attentively. 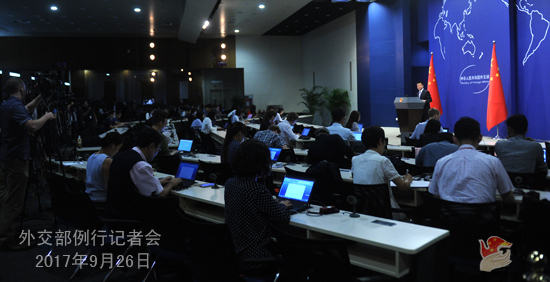 As for whether the US enterprises have received fair treatment in China, the competent officials of China's Ministry of Commerce have also made relevant statements recently and you can also refer to them. I would like to give a brief reply that the China-US economic relations and trade, which has enjoyed growth over the past nearly four decades, is mutually beneficial in nature. I have said before and I want to repeat that if the China-US economic relations and trade was only beneficial to the Chinese side and did no good to the US, the US entrepreneurs would not have operated in China for so many years and their non-financial direct investment in China would not have maintained the momentum of growth.